Fibers from clothes made with synthetic materials are going through washing machines, into wastewater systems and eventually into rivers and oceans. One day last summer, the sailboat American Promise set off from a dock near the Brooklyn Bridge in search of unusual prey in the Hudson River: tiny pieces of plastic, much thinner than a strand of hair. These microfibers are shed by every garment that is made with synthetic materials and has been put through a washing machine. When the water is expelled from the machine, it goes into wastewater systems and eventually into rivers and oceans, where it has become a major source of concern to environmentalists and marine-life researchers. 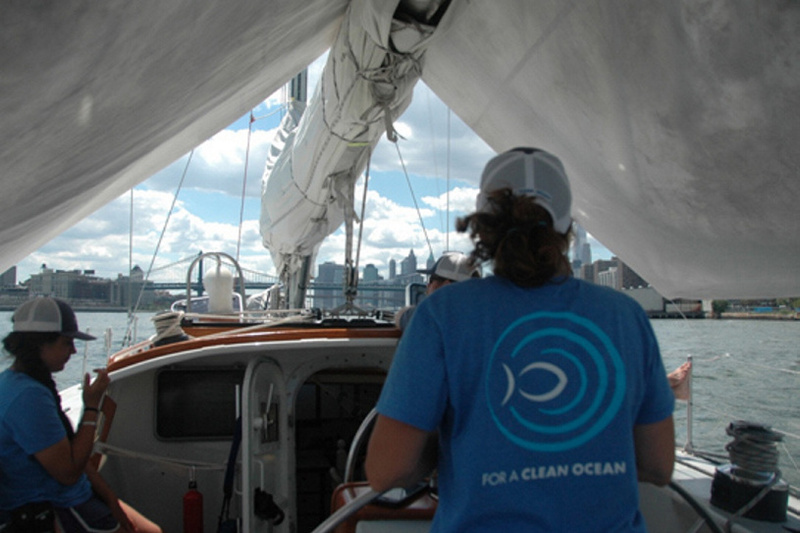 The American Promise and its crew navigate the Hudson River in New York Harbor as part of an effort to see how pervasive microfibers have become in U.S. waterways. Rachel Cernansky. 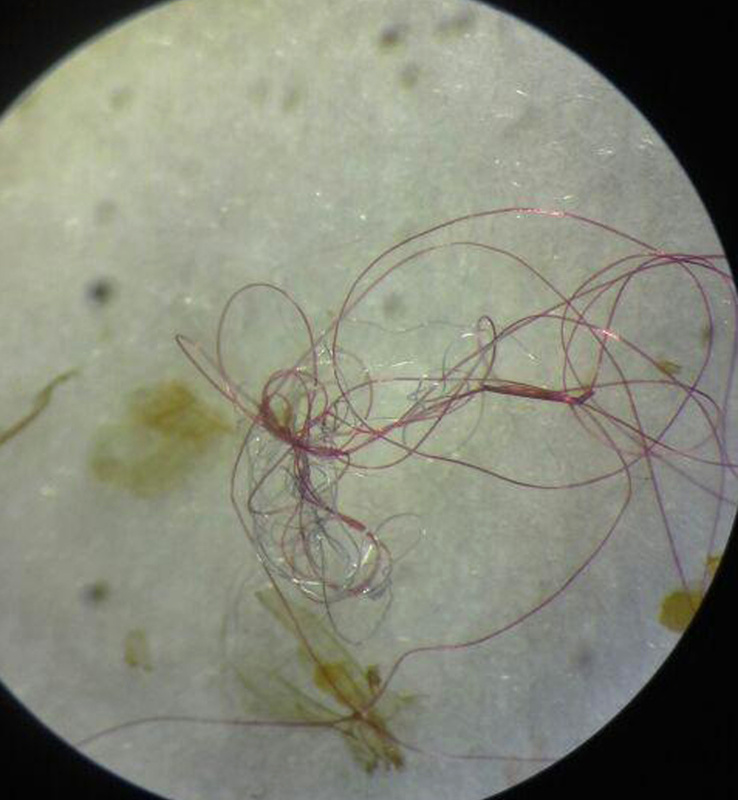 Microfibers taken from a fish in the Great Lakes are seen through a microscope. Scientists believe fish and other aquatic life are ingesting the bits of plastic, causing them to eat less and affecting their growth and survival. A 2011 study that found microfibers on shorelines around the world first uncovered the problem. “I surveyed thousands and thousands of kilometers of ocean. We found microfibers in nearly 90 percent of the samples, and in every sample we found fibers, they were the majority of particles we identified,” said Amy Lusher, a British-based microplastics researcher and a co-author of a 2014 study of microplastic pollution in the Northeast Atlantic Ocean. Microfibers are part of the larger problem of microplastic pollution, which has gained attention in recent years as tiny pieces of plastic – usually defined as smaller than 5 millimeters, or about the size of a single piece of short-grain rice – accumulate in surface waters around the globe. Microplastics generally refer to small fragments of plastic that result from the microbeads used in such items as cosmetics and toothpaste – the latter burnish teeth to make them whiter – and from the breakdown of bags, bottles and other plastics that make their way into our waterways. The Great Pacific Garbage Patch, a giant, collection of marine debris, is the most famous manifestation of the problem, but tiny plastics are turning up just about everywhere scientists look, including the Great Lakes and Antarctica. What the enormous stream of microfibers means for the health of the world’s waterways – and for the marine animals living in them – remains unclear. The limited research on the topic suggests that marine organisms – with smaller animals being the most vulnerable – are ingesting the fibers, which leads them to eat less food, potentially harming their growth and survival prospects. “As a research community, we’re still in the really early stages of figuring out what the effects of microplastics are on organisms in the environment,” said Andrew Watts, a scientist at the University of Exeter in the United Kingdom. Only recently have researchers realized that synthetic clothing is a major contributor to the microplastics problem. A 2011 study looking at the composition of microplastics found on shorelines around the world first raised the alarm, saying that microfibers dominated the plastic debris they found and seemed to be coming from clothing being washed. In response, Patagonia, which produces hugely popular fleece and other outerwear using synthetics, commissioned another study to better understand the problem. “We were faced with this issue, and we wanted to try to understand from scientists what exactly our contribution was to the problem,” said Jill Dumain, director of environmental strategy at Patagonia. The research, published in June, found that a single synthetic fleece jacket released as much as 250,000 microfibers, or 2.7 grams – about the weight of a Ping-Pong ball – when washed in a machine. The study also found that top-loading washing machines cause more shedding than front-loaders, that older garments shed more than new ones and that higher-quality garments shed less than lower-quality ones. What drives these variations is unclear and is part of what Patagonia plans to continue studying. 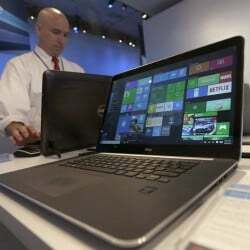 In the meantime, the company is looking for solutions that could mitigate the problem, including product redesign to reduce fabric degradation and discussions with the appliance industry to incorporate some kind of apparatus into laundry equipment – possibly like the lint catchers that are built into dryers – that would keep fibers from being discharged into wastewater. The American Promise’s Hudson River trip was part of an effort by the nonprofit Rozalia Project to see how pervasive microfibers have become in U.S. waterways. The researchers were collecting water samples every three miles along the river to document the types and concentrations of microfibers. They were hoping as well to figure out how the fibers might be entering and moving along the river – looking to see whether there were concentrations, for example, near population clusters or near wastewater treatment plants. Abby Barrows, a microplastics researcher for the nonprofit Adventurers and Scientists for Conservation who is analyzing the American Promise water samples, said microfibers were turning up in most of the samples she’d processed so far.